GTS Events 2018! Running between Sept to Oct 2018! We will be running our annual GTS events, between Sept to Oct 2018 this year! 4 - 6 copies of Let's Go Eevee & Let's Go Pikachu will be available. The amount of prizes depend on participation from members! Events this year will include Nintendo Switch GTS Plays! Join us on PO, and play live on Nintendo Switch with us! 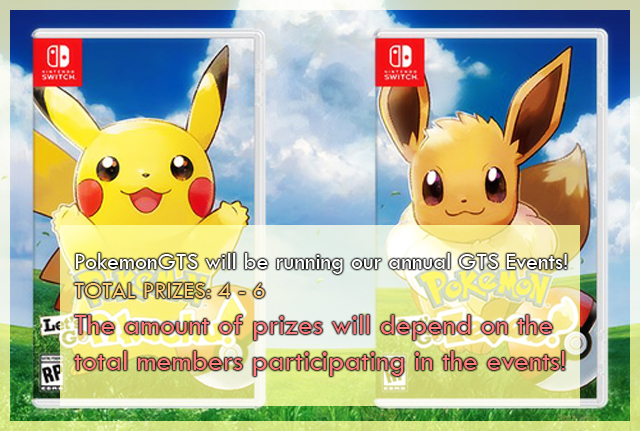 RE: GTS Events 2018! Running between Sept to Oct 2018! Can't wait to see the package get lost in the horrendous mail system mexico has win a copy! Yeah darside, lost... I didn't take it that's for sure. For any foreign winners outside of North America, you may just get an eShop gift code from me instead. That'll be in the finalized rules & conditions. (Aug 24, 2018 7:39 PM)Avia wrote: For any foreign winners outside of North America, you may just get an eShop gift code from me instead. Does this mean darside could actually get the prize in time? I will try my best to join with you guys! (Aug 24, 2018 7:45 PM)FlameTheDragon wrote: Does this mean darside could actually get the prize in time? We'll be officially starting it this Saturday, September 8th, running until November 3rd, with winners announced on November 10th! Nice, I'll harass all my sisters to participate and then steal all their copies if they win. I expect nothing less from the ruler of a dozen sisters. Would it be cool if you send me one TPM? Maybe a switch too, asking for a brother. (Sep 03, 2018 3:37 PM)FlameTheDragon wrote: Would it be cool if you send me one TPM? Maybe a switch too, asking for a brother. What? He told me he was going to take yours.